The value of a Royal Visit, 1967 - 5 cents 1967 stamp depends on several factors such as quality and wear, supply and demand, rarity, finish and more. Values in the section are based on the market, trends, auctions and recognized books, publications and catalogs. This section also includes information on errors and varieties and characteristics. 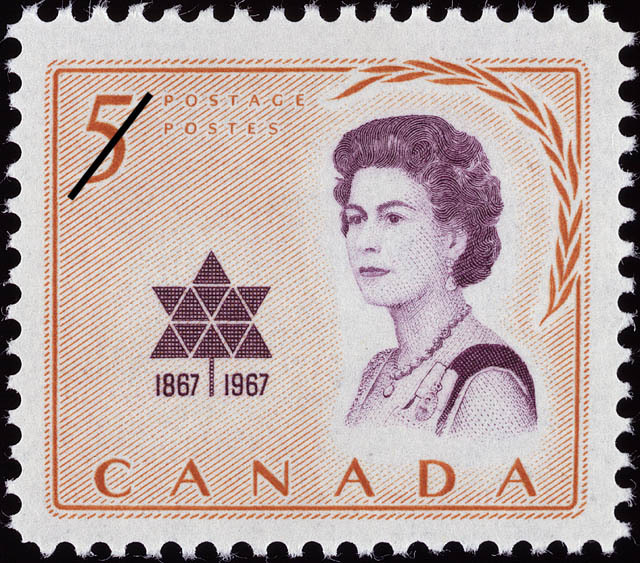 The visit of Queen Elizabeth II to participate in Canada's Centennial celebration is honoured by this Canada Post Office commemorative stamp. Her Majesty, accompanied by her husband, Duke Of Edinburgh, were in the national capital, Ottawa, for ceremonies on the July 1, 1967 to mark the anniversary of the day 100 years ago when Canada came into existence as a sovereign nation. Queen Elizabeth, who was born on the 21st of April 1926, succeeded to the Throne on the 6th February 1952. On the date of her succession, caused by the sudden death of her father, King George VI, in England, she was in Kenya enroute with her husband for a tour of Australia and New Zealand. 5 months earlier the couple had visited Canada and the United States. The Coronation of Queen Elizabeth took place in historic Westminster Abbey on the June 2, 1953. A son, Prince Charles, born on the November 14, 1948, Prince of Wales, and a daughter, Princess Anne, born on the August 15, 1950, were born prior to the Queen's accession to the Throne. Andrew, born on the February 19, 1960, was the 1st child born to a reigning British Sovereign for more than a century; a 4th child, Edward, was born on the March 10, 1964. Canada's Centennial Year Royal Visit stamp was designed and printed by the Canadian Bank Note Company Limited, Ottawa. To the right, in royal purple, it features an engraving of Her Majesty's likeness from a photograph by Anthony Buckley, of London, England; to the left, also in purple, appears Canada's Official Centennial symbol and the dates 1867 - 1967. The remaining elements of the design, including a symbolic branch of laurel leaves framing the Royal image, are printed in gold on a lighter gold background.